second , added models seem to work just fine and chase me but they have no emergency lights/sirens at all. Can added models activate the vigilante mission? Keys can now be altered through menu (or the ini). Hi Jack, is the ini file included in this editor, the default settings of the vanilla game? No, all settings are set to default. Menu can help you. Just close the ini before you use the menu. I've also enjoyed your helicopter mod. I had so much fun creating that mod. Good old times. Btw you can set the heli speed through wanted level editor menu now. EDIT: The menu had some problems (corrected). Download link is updated. Hello, I got some questions, sorry. Whenever I put hunters on military zone (at 5 stars) they appear but drive really badly, even crash their helicopter and explode. I guess this could be changed with the hunter handling right? and besides that, the Hunters don't attack with their missiles or machine guns, they act like police helicopters (with megaphone sounds, etc). Do you know how I can make them use their weapons instead? I tried installing this mod but it appears to conflict with fastman92's limit adjuster. Added vehicles will no longer spawn and attempting to spawn them will cause the game to crash. Why is this? Ah, yes, it's happened to me as well. I added police cars with IVF functions and the police vehicles wouldn't spawn. Some did spawn but they would crash the game almost immediately and their IVF lights wouldn't work either. I wouldn't recommend to replace a car with sirens tho, because the sirens would still be there even when the vehicle is replaced. I replaced the Enforcer for the Police Buffalo and the enforcer lights were still working and since it's a truck, the lights were floating in the air on top of the Buffalo police car xD (The Fbitruck doesn't have emergency lights). Another update - Wanted Level Editor 2.01. More details (plus the download link and the new video) at the 1st page. Hunter attacks with the missiles now. Wanted Level Editor 2.02 last update - 09.03.2018 - check the first page. The drop of fames per second aka FPS was caused by the ini file size. In this version I drasticly decreased the ini file contents there for its size (from 900 kb to 124 kb). This should decrease the negative mod effect on the gameplay much better then the previous mod versions. If you however still notice a frame drop you should increase the stream memory by using fastman92 limit adjuster. I tested «WLE» and me do not like this picture with the policeman sticking out in the roof. another thing is scripts like "cops_incars_fire"
Unfortunately, when scripts like "cops_incars_fire" used together with "WLE", there are frequent game crashes. How make setting "WLE" for full compatibility with such scripts?, also I would like to have light version "WLE" only with the main settings. Well, finally I do not like the complete disabling of the player's immunity. 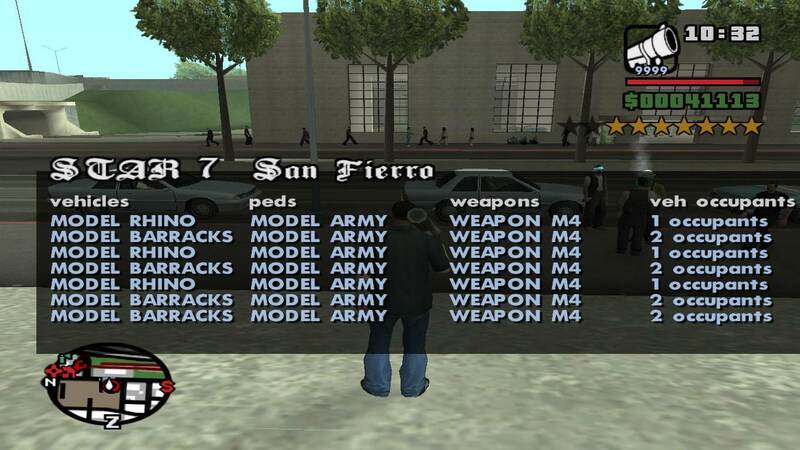 Zone Settings -> select the city -> select the star -> cars, peds, guns, occupant(s) -> remove "DriverAndGunman" and select "2 occupants" -> return to General Settings. Strange. I was using "cops_incars_fire.cs" and I still use it so I'm pretty sure that this mod is actually compatible with the wl editor. So I don't know what's the problem. It's something else you have - crash report might help. Sadly since there're a lot of mods, the option to make all of them compatible does not exist and it never will (I'm not talking just about these mods). main settings are General Settings. Police stars (STAR1, STAR2 and STAR3) can be modified only in Zone Settings. However settings for those stars will work even if you reselect General Settings and start modifying higher stars (STAR4, STAR5...). In short - Zone Settings for the 1st 3 stars can not be effected by General Settings (All Areas). After you finish with modifying the Police stars (STAR1, STAR2 and STAR3) by selecting the Zone Settings, you should return to General Settings and start modifying higher stars (STAR4, STAR5...). To make things even faster I left the option called "Enable Multiple Models" for each wanted star (and/or zone). However this is not recomeded if you decide to use multiple vehicles/peds/weapons. In that case you should leave "Enable Multiple Models" as is (enabled). Why not just use a XML or JSON file instead of an INI file? I have no experience. Some mod examples might help though. If you mean DriverAndGunman option then I don't understand. You said that you don't want the gunman to be attached on the police car right? Or I missunderstood you? I just mean that in this particular case this is not the best way to implement the idea of gunning from the car. WL editor is definitely compatible with that mod. I was playing it for quite some time - it works great, I don't know what else to say to you. Just overwrite the cs file and it should work fine. Your settings will not be changed. To install simply overwrite the ini file in the cleo folder. 1. How to store DSHER to DESERT area? Since the option only the country side. 2. How to spawn HUNTER at star7+? I tried but no success, game always crash when i changed chopper model to HUNTER even i've changed the occupant to 1 too. I didn't make it available through the menu though. I'll do it later if necessary. For me it just keeps crashing. Any help? I did everything the installation said. another thing is scripts like "cops_incars_fire﻿"
Could you provide link for mod "cops_incar_fire"? 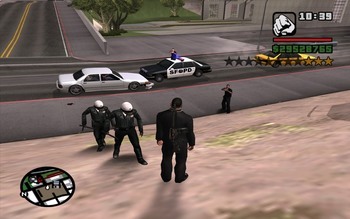 - your gta san andreas game version should be 1.00 US and use the latest mod version. - it might be that some other mods you're using are incompatible with this one. I have a question, why is it buggy when the police helicopter search light is used? and it crashes after a moment so I always need disable it. Also, the police pilot and gunners and the police biker sometimes are buggy and the skins that I put in the ini file don't always appear for some reason. 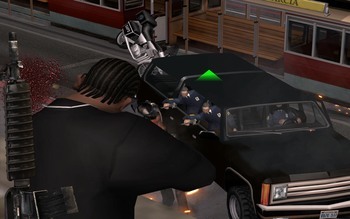 Like the Swat is supposed to be the pilot and gunner of the helicopter but sometimes (not always) a police biker appears in its place and for the police bike, the fbi, swat, or the army can be seen it them after I died at 4, 5, or 6 stars xD That was with WLE 2.01 tho. I don't use 2.02 because the hunters wouldn't attack with missiles in that version, but with the police "ghost gun" and the army would be coming out of the hunter in ropes, like if it was a police maverick haha. Does it mean, that Mr Whoopie should spawn two times more frequent than police car or both cars would spawn in the same frequency, and those slots are just for more variations? All of the errors you mentioned are well known to me and they should be removed in the next (asi) version of this mod. I'm not quite sure since the code chooses a random value between 1 and 6 (probably Mr. Whoopie spawns two times more frequent than police car - it's a biger chance that the random value will be the one with more equal results which is in this case MODEL_MRWHOOP). And yes - you can put more vehicle variations - all of them will appear at the point specified by the menu. - select sensivity to crime and confirm. I'm sorry to bump this topic but i'm in need for help, i keep trying to add new police peds, but the game crashes, why does this happens? i've increased the limit with fastman, and i have a lot of regular pedestrians added to my game, so that won't be the problem, why is it that this only happens with cops? i ask here, because i'm doing this to use them with your mod, and i suppose someone had the same intention. Hey! sorry to bother you but is it possible to restore the unused deputy ped to San Fierro rural areas? (Flint County and Whetstone). I saw you made the desert sheriff appear in Las Venturas rural areas (Bone County and Tierra Robada) so I was wondering if you could do the same Flint County and Whetstone. Is there a way to have more than 6 configurable vehicles, peds, etc.